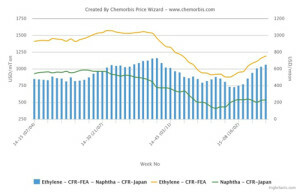 According to ChemOrbis, players in Asia report that the spread between spot prices for ethylene and naphtha continues to expand as supply limitations are pushing ethylene prices up while naphtha prices have been fluctuating along with oil markets. Spot ethylene prices witnessed further increases on the week as the heavy cracker turnaround season in South Korea along with some unexpected shutdowns in Southeast Asia kept availability tight. Supply tightness is said to be keeping sentiment firm over the short term, although some players voiced concerns that the recent rally in the ethylene market may struggle to sustain itself as high ethylene prices are resulting in thin margins for derivative producers. Spot ethylene prices have risen by around $250/ton since the start of March while spot naphtha prices have declined by around $30/ton over the same period. 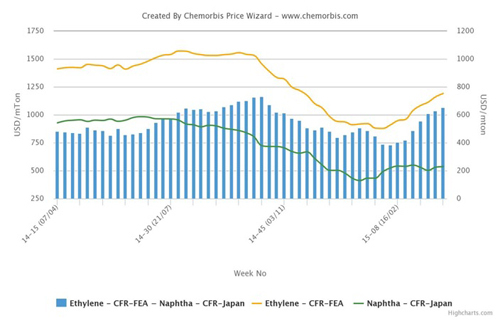 According to data from ChemOrbis Price Wizard, spot ethylene prices on a CFR Far East Asia basis are currently carrying their largest premium relative to spot naphtha costs since October of 2014. The spread between ethylene and naphtha has risen by $270/ton since touching its lowest level for 2015 to date in early February. The premium carried by ethylene over naphtha has been rising at an accelerating pace for the past few weeks and has gained around $100/ton since the start of March to move above the $650/ton threshold. In production news, South Korea’s LG Chem is currently conducting a shutdown at its 900,000 tons/year in Daesan. The cracker is expected to resume production later this month. Also in Daesan, Samsung Total is planning to shut its 700,000 tons/year cracker for a 40 day maintenance this month. In Japan, Idemitsu Kosan is expected to undergo a planned two and half month shutdown at its 374,000 tons/year cracker in early April. In addition, China’s BASF-YPC is slated to conduct a two month shutdown at its 740,000 tons/year cracker in Nanjing in the April-May period.